Unibet BetUP is a brand new In-Play betting experience where you can win big with your predictions of what will happen next. Win cash prizes from our guaranteed prize pool with this industry first 2nd screen experience. In this competition you must answer to Unibet questions, and for each correct answer you will receive points to get a better place in the competition. 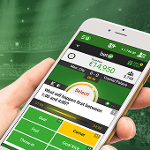 BetUP is a betting competition launched by Unibet, in a live format, powered by Commologic, which will be available for your desktop, tablet channels and for mobile. Unibet is one of the top European bookmakers. Established in Sweden and licenced to operate from different jurisdictions such as Malta, UK, Australia, France, Belgium, Denmark and Romania, Unibet is a trusted brand in online sports betting, awarded several years the “Best Sportsbook of the Year” award. New users can enjoy a great bonus at Unibet on registration, based on their country of residence. Welcome bonuses and mobile free bets are up for grabs, with special promotions around major events such as the Euro 2016 tournament, Champions League or World Cup.